IMT Enhances Dominator® Line with Three New Features - Iowa Mold Tooling Co., Inc. : Iowa Mold Tooling Co., Inc.
Iowa Mold Tooling Co. Inc. (IMT), an Oshkosh Corporation company (NYSE:OSK), is pleased to announce three new enhancements to its Dominator line of service trucks. 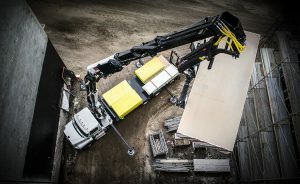 Innovative improvements to the boom support, master lock system and rear access package build upon the best-in-class quality and dependability IMT is known for, while streamlining the Dominator truck user experience. The boom support will now be built standard with molded urethane in place of rubber. The shock absorbing, weatherproof urethane is formed over sheet metal, which provides dependable support. As a company always on the lookout for ways to innovate, IMT is proud of its new, optional master lock system. The new master lock is a spring-loaded system with a push-pull operation that ensures a secure lock every time. Users will have peace of mind with the new master lock system. Convenient access has always been a priority in the Dominator line, which inspired the improvements to the upgraded rear access package. Keeping the Occupational Safety and Health Administration’s three points of contact guidelines in mind, IMT equipped the Dominator with an extended handle and an extra step. The handle provides more surface for two hands to make contact, while the extra step reduces the height of the initial step as well as the distance between steps. This access package is now standard across the Dominator product line. These three improvements ensure exceptional performance, safety and convenience across IMT’s Dominator line. Ever-improving, IMT continues to develop innovative features for its service trucks. Further enhancements specific to the Dominator line will be announced at CONEXPO in March 2017. For more information on IMT, visit www.imt.com. 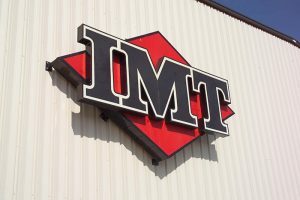 IMT is on Facebook at www.facebook.com/iowamoldtooling, Instagram at www.instagram.com/iowamoldtooling, Twitter at www.twitter.com/iowamoldtooling and YouTube at www.youtube.com/iowamoldtooling.